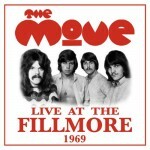 The Move are barely known in the U.S., but their impact on the late-60s British rock scene, and all that tumbled from it, reverberates through to today. By the end of their run, they’d evolved an artier sound that would find full-flower as founders Roy Wood and Bev Bevan, and latter-day member Jeff Lynne, decamped to form the Electric Light Orchestra. But in their prime, they were a rock powerhouse that matched up to the Who’s incendiary music and daring social antics. The group is captured in full-flower of their most famous incarnation on these soundboard tapes, recorded at San Francisco’s Fillmore West in October 1969 on their first and only tour of the U.S. These tapes have floated around bootleg circles, but this is the first complete and official release, endorsed by Sue Wayne, the widow of the band’s vocalist, Carl Wayne. Wayne had saved the tapes for over thirty years, but it was only in 2003 that digital restoration became sufficiently sophisticated to bring this archive back to life. Sadly, with Wayne’s passing in 2004, the project was once again sidelined. Now fully restored, the song list, plus a ten-minute interview with drummer Bevan, clock in at nearly two hours. The selections include their early single “I Can Hear the Grass Grow,” and fan favorites “Cherry Blossom Clinic Revisited” and “Hello Susie.” Also included are covers of Nazz’s “Open My Eyes” and “Under the Ice,” Mann & Weil’s “Don’t Make My Baby Blue” (which the Move likely picked up from the Shadows), Tom Paxton’s “The Last Thing on My Mind” and Ars Nova’s “Fields of People.” The set is surprisingly light on Roy Wood songs, given his position as the band’s main songwriter, but bits of stage patter help sew everything together. This entry was posted on Tuesday, December 27th, 2011 at 5:32 pm	and is filed under CD Review, MP3 Review, Video. You can follow any responses to this entry through the RSS 2.0 feed. Both comments and pings are currently closed.